Being stopped by police is a stressful experience that can go bad quickly. Here we describe what the law requires and also offer strategies for handling police encounters. We want to be clear: The burden of de-escalation does not fall on private citizens — it falls on police officers. However, you cannot assume officers will behave in a way that protects your safety or that they will respect your rights even after you assert them. You may be able to reduce risk to yourself by staying calm and not exhibiting hostility toward the officers. The truth is that there are situations where people have done everything they could to put an officer at ease, yet still ended up injured or killed. You do not have to consent to a search of yourself or your belongings, but police may pat down your clothing if they suspect a weapon. Note that refusing consent may not stop the officer from carrying out the search against your will, but making a timely objection before or during the search can help preserve your rights in any later legal proceeding. If you are arrested by police, you have the right to a government-appointed lawyer if you cannot afford one. Stay calm. Don’t run, resist, or obstruct the officers. Do not lie or give false documents. Keep your hands where the police can see them. If you have been arrested by police, you have the right to make a local phone call. The police cannot listen if you call a lawyer. They can and often do listen if you call anyone else. Stand at a safe distance and, if possible, use your phone to record video of what is happening. As long as you do not interfere with what the officers are doing and do not stand close enough to obstruct their movements, you have the right to observe and record events that are plainly visible in public spaces. Do not try to hide the fact that you are recording. 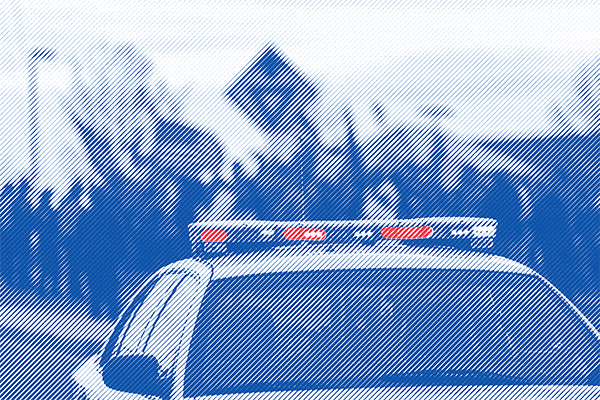 Police officers do not have a reasonable expectation of privacy when performing their jobs, but the people they are interacting with may have privacy rights that would require you to notify them of the recording. In many states (see here) you must affirmatively make people aware that you are recording them. Police officers may not confiscate or demand to view your photographs or video without a warrant, and they may not delete your photographs or video under any circumstances. If an officer orders you to stop recording or orders you to hand over your phone, you should politely but firmly tell the officer that you do not consent to doing so, and remind the officer that taking photographs or video is your right under the First Amendment. Be aware that some officers may arrest you for refusing to comply even though their orders are illegal. The arrest would be unlawful, but you will need to weigh the personal risks of arrest (including the risk that officer may search you upon arrest) against the value of continuing to record. Whether or not you are able to record everything, make sure to write down everything you remember, including officers’ badge and patrol car numbers, which agency the officers were from, how many officers were present and what their names were, any use of weapons (including less-lethal weapons such as Tasers or batons), and any injuries suffered by the person stopped. If you are able to speak to the person stopped by police after the police leave, they may find your contact information helpful in case they decide to file a complaint or pursue a lawsuit against the officers. Both drivers and passengers have the right to remain silent. If you’re a passenger, you can ask if you’re free to leave. If yes, you may silently leave. Turn off the car, turn on the internal light, open the window part way, and place your hands on the wheel. If you’re in the passenger seat, put your hands on the dashboard. Avoid making sudden movements, and keep your hands where the officer can see them. If you have been arrested by police, you have the right to make a local phone call. The police cannot listen if you call a lawyer. They can and often will listen to a call made to anyone else. You should not invite the officer into your house. Talk with the officers through the door and ask them to show you identification. You do not have to let them in unless they can show you a warrant signed by a judicial officer that lists your address as a place to be searched or that has your name on it as the subject of an arrest warrant . Ask the officer to slip the warrant under the door or hold it up to the window so you can read it. A search warrant allows police to enter the address listed on the warrant, but officers can only search the areas and for the items listed. An arrest warrant has the name of the person to be arrested. Even if officers have a warrant, you have the right to remain silent. You should not answer questions or speak to the officers while they are in your house conducting their search. Stand silently and observe what they do, where they go, and what they take. Write down everything you observed as soon as you can. Write down everything you remember, including officers’ badge and patrol car numbers, which agency the officers were from, and any other details. Get contact information for witnesses. If you are a guest inside the house and end up answering the door, you should make clear to the police that you are a guest and do not have the authority to let them inside without the homeowner’s permission. Say you wish to remain silent and ask for a lawyer immediately. Don’t answer any questions or give any explanations or excuses. If you can’t pay for a lawyer, you have the right to a free one. Don’t say anything, sign anything or make any decisions without a lawyer. You have the right to make a local phone call. The police cannot listen if you call a lawyer. They can and often will listen to a call made to anyone else. Do not resist arrest, even if you believe the arrest is unfair. Follow the officers’ commands. When you can, write down everything you remember, including the officers’ badge and patrol car numbers and the agency they work for. Get contact information for witnesses. File a written complaint with the agency’s internal affairs division or civilian complaint board.